The best stag weekend activities in Scotland - If you are looking for some fun and adventurous stag weekend activities in Scotland or hen weekend activities then Active Highs have a fantastic range of activities for that stag weekend or hen weekend with a difference! You can mix and match from our activities and you can be sure to find something that meets your requirements. Active Highs do offer some of the more extreme adventure sports that are guaranteed to get you pulse racing such as canyoning & white water rafting. We also have some more relaxed activities available if you are looking for a more relaxed experience for your last weekend of freedom. Active Highs offer Quality & fun activities, an accommodation booking service or recommendations on where to stay. We can organise lunches from pies to seated meals, travel advice, minibus & driver booking service Please read our booking terms and conditions prior to making a booking for your stag weekend. 2014 White Water Rafting Dates We now have the long awaited release dates for white water rafting on the River Garry this year! The River Garry is a dam release river which means that once or twice per week the dam opens and floods the river with water from the loch above. originally the freshet releases of water were agreed by the land owner and the Hydro board (now Scottish and Southern Energy) to aid the Atlantic Salmon to return up the River Garry to spawn and reproduce their young. These releases of water also just happen to turn an otherwise dry riverbed into a fantastic white water river with rapids of up to grade 3 & 4 and it is perfect for white water rafting and white water kayaking. The water releases for 2014 start on Saturday the 22nd of March and carry on weekly until the end of October. There are several good bouncy adrenaline pumping rapids on the River Garry including "Double or Quits", "Surfs Up", "Hey Diddle Diddle" and "Satan's sphincter". White water rapids are graded on a scale of 1 to 6 with grade 1 being the easiest and not much in the way of adrenaline and excitement and grade 6 which is at the limit of navigation (trust me, you wouldn't want to raft grade 6!). The River Garry is right in the middle of the grading system at big grade 3, touching grade 4 making it ideal for white water rafting for families, stag weekends, hen weekends and corporate events in Scotland. Our white water rafting pages have live availability for our River Garry trips and they can now be booked and paid for online for your convenience! Don't miss out on this fun filled adventure this year! See you on the river! The Stag & Hen Weekend Season Has Started! Well it must be getting nearer to the wedding season as we have started to entertain lots of strangely dressed and slightly tried and shabby looking young (& some not so young) men out on their mates stag weekends. Stag weekends in Scotland, are now quite often involving some form of adventurous activity to break up the hedonism! 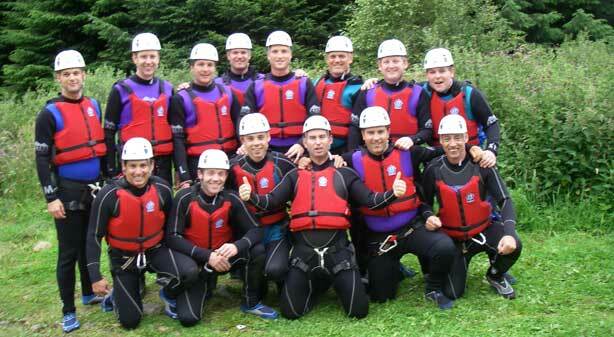 Last Saturday we were out canyoning with a great bunch of guys that descending on the Fort William area for an adventurous stag weekend and the next couple of weekends are going to be a combination of funyakking for a mixed age group from 20's to 70's and white water rafting and canyoning for more adrenaline lovers. We still have some space for white water rafting on the River Garry on Saturday the 4th of May, Saturday the 1st & 22nd of June. This is the best guaranteed white water rafting trip in Scotland due to the release of water from the dam at the top of the river! 10 % Discount for groups of 8 or more on the above dates or book funyakking and canyoning or gorge walking for a group of 10 or more and save £10 pp during May & June!